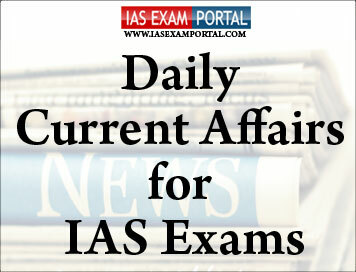 Current Affairs for IAS Exams - 6 September 2018 | IAS EXAM PORTAL - India's Largest Community for UPSC Exam Aspirants. The Cabinet Committee on Economic Affairs, chaired by the Prime Minister ShriNarendraModi has approved continuation of the Centrally Sponsored Umbrella Scheme of Integrated Development of Wildlife Habitats (CSS-IDWH)beyond the 12thPlan period from 2017-18 to 2019-20. The Scheme consists of Centrally Sponsored Scheme of Project Tiger (CSS-PT), Development of Wildlife Habitats (CSS-DWH) and Project Elephant (CSS-PE). These schemes would generate employment opportunities resulting in economic upliftment of people in and around tiger reserves/ Protected Areas besides leading to reduction in natural resource dependency with substitution by clean energy use. The Supreme Court on Wednesday refused to provide a copy of the full report of Assam NRC Co-ordinator PrateekHajela to the Centre on what excluded citizens could offer as proof of ancestry. However, the previous hearing had also seen the Bench of Justices Gogoi and RohintonNariman raise questions about the Centre’s willingness, expressed in its draft Standard Operating Procedure (SOP) for receiving claims and objections, to allow claimants another chance to prove their Indian ancestry by submitting fresh documents. The court’s questions had prompted AGMr.Venugopal to plead that the government was only giving “another chance to people who risk losing all their rights.” Finally, the Bench had ordered Mr.Hajela to file a report on the ramifications of the Centre’s proposal. The Supreme Court on Wednesday lifted its August 31 order staying construction activities in landslide-hit Uttarakhand for not placing on record in court its solid waste management policy. It had imposed a fine of Rs. 3 lakh each on Maharashtra and Uttarakhand, along with Madhya Pradesh and the Union Territory of Chandigarh, for not complying with a July direction of the apex court to place on record their respective policies under the Solid Waste Management Rules, 2016. While Maharashtra lawyers blamed a “communication gap,” as the State had already framed a policy in 2017, the Uttarakhand side submitted its policy was awaiting Cabinet approval. Uttarakhand said it had been hit by calamity and the fine imposed on them should be channelled for rescue operations in the State. It described how landslides have caused the appearance of an artificial lake in TehriGarhwal area and around 13 villages were in danger. The court allowed the plea. Towards the end of the hearing, the court questioned Maharashtra about the utilisation of cess collected under the Building and Other Construction Workers (Regulation of Employment and Conditions of Service) Act, 1996. It sought a reply from Maharshtra by September 11 on what steps had been taken to use the funds for the welfare of construction workers in Mumbai. The Securities and Exchange Board of India (SEBI) will soon review its circular issued in April that barred Non-Resident Indians (NRIs), among others, from managing funds they invest in India. The circular became contentious with an industry body estimating that it could lead to outflows of $75 billion, though the regulator brushed aside any such concerns. On Wednesday, the capital markets regulator said that a working group constituted under H.R. Khan, former RBI deputy governor, met with industry participants and would soon give its recommendations to SEBI, which would then review the entire matter. On April 10, SEBI issued a circular stating that entities like NRIs, Person of Indian Origin (PIO) and Overseas Citizen of India (OCI) cannot be the beneficial owners of any foreign portfolio investor (FPI). It further stated that FPIs that did not comply with the framework would be given six months to either change their structure or wind up their positions in India. Last month, SEBI extended the deadline till December 31. India and the United States are in a deadlock over contentious trade issues after the Donald Trump administration sought a formal commitment of additional purchases of $10 billion annually for the next three years, as part of a trade agreement under negotiation. As both countries seek to reiterate their strategic partnership at the first 2+2 dialogue in New Delhi on Wednesday, India is in the crosshairs of economic nationalists in the Trump administration. India has a surplus of $23 billion in trade with America, and the U.S. wants to wipe that off by forcing more imports by New Delhi, as part of a proposed trade agreement. Officials of the U.S. Trade Representative (USTR) office also aggregated all existing market access issues with India in the negotiations that were initially planned on questions related to the American review of India’s Generalised System of Preferences (GSP) status and the steel and aluminium tariffs imposed by the Trump administration. Thursday’s discussion is expected to take a comprehensive look at strategic ties between India and the U.S. On top of the discussion is the likely US plans to have a landmark agreement on communication and coordination on security issues – COMCASA and sale of high tech military items. The Hindu had reported on Monday that both sides are likely to fall short of formally signing the COMCASA document. The other major U.S. concern is the S400 missile defence shield worth $6 billion that India plans to acquire from Russia. U.S. media sources have reported that both the issues would feature prominently in Thursday’s talks. Speaking on the occasion, the President paid tributes to India’s teachers, scholars and academics. He said they have drawn from India’s age-old traditions of learning and wisdom - and they have contributed to India’s reputation as a knowledge power. Across continents, Indian scholarship and academic excellence is recognised. It adds to the global economy and knowledge structures – and it earns India goodwill. The President said that the technology and digital revolution is being led by young people from campuses. The university campuses of the 21st century are not just providers of degrees but also hubs of innovation and entrepreneurship and incubators of start-ups and small businesses driven by technology – and by creative minds buzzing with ideas and designing game-changing apps. Addressing the gathering, the President said the Indian diaspora in Bulgaria constitutes a living bridge between the two countries. Their numbers may be small but they have made appreciable contributions to fostering bilateral ties. The President appreciated Friends of India for creating a network of cultural and academic institutions, yoga schools and ayurveda centres in Bulgaria. He noted that the Indology Department of Sofia University has been doing stellar work for the past 35 years. Its scholars have translated eight of the principal Upanishads from Sanskrit into Bulgarian. The Army has selected SpyLite mini-UAV for high-altitude aerial surveillance. The mini-UAV is built by Cyient Solutions & Systems (CSS), a joint venture between Cyient Ltd of India and BlueBird Aero Systems of Israel. “The CSS offered, and successfully demonstrated, its flagship mini-UAV system, SpyLite, which was the only one that met end-user requirements,” the CSS said in a statement. The system delivered high-quality day and night videos,” it added. According to the company website, SpyLite has an endurance of 4-5 hours and a maximum flight ceiling of 30,000 feet making it ideal for operations along the border with China as well as on the Siachen glacier. Ambitious action on climate change could contribute an extra $26 trillion to the world economy by 2030, international experts said on Wednesday, urging nations and businesses to step up their engagement. The economic benefits offered by a shift to a low-carbon economy have been “grossly” underestimated, according to the Global Commission on the Economy and Climate, a think tank grouping former heads of government and top economic and business leaders. Dynamic action on climate could also generate “over 65 million new low-carbon jobs” by 2030 and avoid over 7,00,000 premature deaths due to air pollution, it said. But policymakers were “not taking sufficiently bold action to escape the legacy economic systems,” the study found. The shift would involve change in five key areas: the development of clean energy systems, improved urban planning, a shift towards more sustainable agriculture, smart water management and decarbonising industry. It called on governments to put a price on carbonof at least $40-80 by 2020, and to move towards mandatory climate risk disclosure for major investors and companies. The Asian Games medal winners, some as young as sailor HarshitaTomar, and as old as 67-year-old bridge exponents KiranNadar and HemaDeora, were felicitated by the Union Sports Minister Rajyavardhan Singh Rathore here on Tuesday. The 69-medal haul by India made history at the Asian Games. The 15 gold medals equalled the feat of the first Asian Games in 1951 but what stood out was the positivity and energy that prevailed in the Indian contingent even if it surrendered traditional gold medals in hockey and kabaddi but claimed the inaugural bridge and the first in women’s wrestling. India finished with 24 silver and 30 bronze medals in its best Asian Games performance.